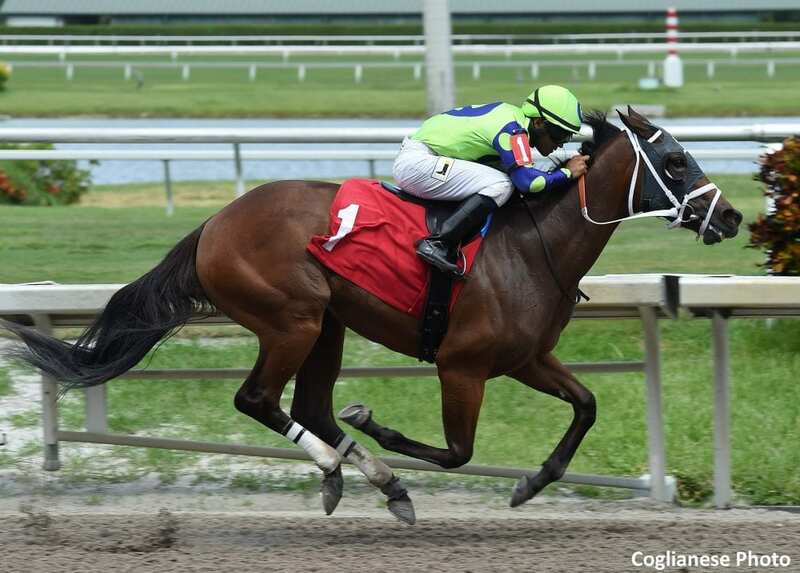 e five Racing Thoroughbreds' Lovesick is scheduled to make her stakes debut in Saturday's $75,000 Juvenile Fillies Sprint at Gulfstream Park West. Win or lose in the six-furlong sprint, one of four stakes for 2-year-olds on the nine-stakes Millions Preview program, the daughter of Adios Charlie has already become worth considerably more than her $80,000 price tag. Lovesick was purchased for what has turned out to be a bargain price at the OBS April sale for 2-year-olds in training, six months before her full brother, Chad Brown-trained Patternrecognition, led from gate to wire to win the Sept. 22 Kelso Handicap (G2) at Belmont Park. “She ran like an old horse the first time. She's very smart,” trainer David Fawkes said. Also a half-sister to e Five Racing Thoroughbreds' multiple-stakes winner Florida Fuego, Lovesick ran 4 ½ furlongs in a solid 51.91 seconds. Paco Lopez has been named to ride Lovesick for the first time Saturday. Fawkes is also slated to saddle stakes-placed Select Friday for a start in the Juvenile Fillies Sprint. The daughter of Kantharos finished off the board in the $400,000 Florida Sire Stakes My Dear Girl Sept. 29. Select Friday, who was purchased by Kales Company LLC for $105,000 at the OBS April sale, debuted with an off-the-pace 3 ½-length victory at Gulfstream. She came right back to finish a deep-closing second in the FSS Desert Vixen Aug. 4 before missing the Sept. 1 FSS Susan's Girl due to health. Nik Juarez has the return mount aboard Select Friday. The Fawkes-trained fillies will face six other entrants, including Starship Nala, who finished second in the My Dear Girl last time out, Joe Sweetness, Crumb Bun, Micah's Girl, Busy Signal and Global Beauty Coco. The Juvenile Fillies Sprint has been carded as Race 5 and will be followed by the Juvenile Sprint in Race 6, Juvenile Fillies Turf in Race 8 and Juvenile Turf in Race 10. Tracy Pinchin's Jackson tops the 10-horse field in the 6 ½-furlong Juvenile Sprint. The son of Kantharos returns to the main track, over which he broke his maiden at first asking July 5, after finishing second on turf in the Hollywood Beach, won by Bulletin, who went on to win the Breeders' Cup Juvenile Turf Sprint last Saturday. Trainer Jose Pinchin gave the return mount to Emisael Jaramillo. Quintessential Racing Florida LLC's Jolie Bay has been installed as the 5-2 morning-line favorite in the Juvenile Fillies Turf, in which a field of nine will run a mile on turf. The Mark Casse-trained daughter of He's Had Enough set the pace before tiring to fifth at Woodbine in the Mazarine (G3) stakes after breaking her maiden in her previous start. Jose Batista has the mount. N T S Stable's Stirling Drive is the 2-1 morning-line favorite in the Juvenile Turf, also to be contested at a mile. The Milt Wolfson-trained son of Verrazano finished third in the Armed Forces at Gulfstream before finishing a troubled-trip fourth in a Gulfstream Park West optional claiming allowance last time out. The Millions Preview program will be kicked off at noon with the running of the Millions Turf Preview in Race 1. Other races that will serve as early preps for the Jan. 19 Sunshine Millions card at Gulfstream Park are the Millions Sprint Preview in Race 2, Millions Filly & Mare Turf Preview in Race 3 and Millions Classic Preview in Race 4. The Millions Distaff is programmed for Race 9. This entry was posted in Racing and tagged Adios Charlie, David Fawkes, e five racing thoroughbreds, gulfstream park west, juvenile fillies sprint, lovesick, millions preview, paco lopez, select friday by Press Release. Bookmark the permalink.